Review of Mary M. Solberg, ed. 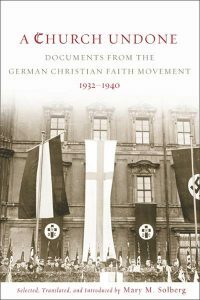 and trans., A Church Undone: Documents from the German Christian Faith Movement, 1932-1940 (Minneapolis: Fortress Press, 2015). Pp. 486. ISBN 9781451464726. Since 1945, Nazism has been universally condemned. Historians have written extensively, but always pejoratively, about its personalities, its politics, its ideology, and particularly its crimes, which culminated in the Holocaust. As a result, less research has been carried out, and always negatively, into the reasons why Nazism gained support from an overwhelming majority of Germans, including many Protestant churchmen and women. Particularly vocal in Nazism’s cause was the minority group pf Protestants known as the German Christian Faith Movement, whose members very actively sought to introduce and popularize Nazi ideas into the liturgical and practical life of their parishes. Mary Solberg has now selected and translated into English a useful collection of this group’s writings, which provide an English-speaking readership with the full range of their ideas. Presumably she feels that the time is not yet ripe, or the audience not yet ready, for any extended analysis of these sources. Despite the excellent contributions of such authors as James Zabel, Doris Bergen and Robert Ericksen, Solberg feels that “far too few people in or out of the academy know far too little“ about the conduct of the churches In Hitler’s Germany. But her extended introduction clearly indicates her approach to answering the questions posed by her documents: specifically what role did this German Christian Faith Movement play in the wider picture; how successful or significant were its supporters in the rise and maintenance of Nazism, at least up to 1940; and how should Christians and churches today learn from this example of a church undone? Her skillful translations of the writings of several prominent members of this movement will be of considerable value to those who do not read German, but it would have been helpful to have a biographical note or appendix outlining the careers of these authors. Her conclusion is that this was not a unique episode, that the conflation of political, racist and nationalist ideas with theological witness is a constant temptation, and therefore that the German experience in the 1930s deserves further study by both theologians and historians. The opening chapter provides us with the original Guidelines of the German Christian Faith Movement, written in 1932 by Pastor Joachim Hossenfelder, who went on to become Bishop of Brandenburg in September 1933. He shared the views of many younger clergymen who regarded the leaders of the various provincial Protestant churches as outdated conservatives. They had failed to catch the spirit of renewal needed to bring Protestant witness up-to-date. By contrast, the Nazi Party had caught the imagination of the people and had already affirmed in its platform through its support for “Positive Christianity”. The church could not afford to be left behind, but should rally its supporters behind the values of the German race, ethnicity, and nation, following the lead given by Adolf Hitler. Armed with this kind of “heroic piety”, the German Christian Movement would be ready to take up the struggle against godless Marxism. The Nazi take-over of power in January 1933 was naturally enthusiastically greeted by the members of the German Christian Movement. They applauded the Nazis’ initial measures against the Jews, such as the law passed in April debarring Jews from public office with the application of the so-called “Aryan Paragraph”. During the summer, church elections saw the supporters of the movement installed in high positions in many church bodies, such as the Synod of the Old Prussian Union Church, which in September resolved to apply the “Aryan Paragraph” to its clergy. But this move aroused vigorous opposition, such as that expressed by Karl Barth, then a professor in Bonn, whose 15-page pamphlet is here reproduced in full. Together with Dietrich Bonhoeffer, whose shorter protest is also given, these forceful objections in defence of Protestant orthodoxy stressed the fact that all Christians were joined in a common baptism, and could not be separated on the basis of racial origin. However, they limited these protests on behalf of those converted Jews who had become Christians and did not raise questions about the wider scope of Nazi persecutions. The members of the German Christian Movement were not so reticent. They called for a more complete renunciation of all things Jewish in both church membership and liturgical practice. In a notably violent speech before a large audience of 20,000 supporters in November 1933, one of the radical German Christians, Reinhold Krause, called for a complete alignment of the church with National Socialism, in particular by “liberating itself from the Old Testament with its Jewish rewards and punishment morality and its stories of cattle-dealers and pimps”. German Christians instead must “return to the heroic Jesus” as a “fearless combatant” against the pernicious influence of the Jewish Scribes and Pharisees. But this speech went too far for the majority of Protestant loyalists who then left the movement, and transferred their allegiance to the nucleus demanding church independence, which later coalesced into the Confessing Church. More effective support for the German Christian Movement came from the theological professors, such as Emanuel Hirsch of Göttingen or Gerhard Kittel of Tübingen, both of whom had distinguished publication records. Hirsch became and remained a “true believer” in National Socialism, even after 1945, since, as he claimed, “God speaks in and to the particular historical situation in which people find themselves – in this case National Socialist Germany”. The church should not isolate itself on the remains of Reformation theology, as did Barth, but instead the church is called to be engaged with the new spirit of national regeneration, and reflect and contribute to the drive for racial purity, which left no room for Jewish Christians. Kittel, the author of the most widely used biblical dictionary, was even more prolific in addressing large audiences up and down the country. He joined the Nazi Party in 1933 and shortly afterwards wrote a major piece on the Jewish issue, which was a central one for all the members of the German Christian Movement. His purpose, according to one source, was to raise the discussion of the Jewish question above the level of slogans and vulgar racism and give it a moral Christian basis. He claimed that there were four solutions to the Jewish issue: extermination, expulsion, assimilation or a guest status, where Jews would be tolerated so long as they kept to separate ways. He judged the first three solutions to be impractical, so argued fiercely for the fourth. After the war, when he was put on trial for his Nazi sympathies, Kittel tried to argue he had been only a moderate campaigner, but the forcefulness of the extracts printed here suggests otherwise. Solberg also provides a number of extracts from the speeches or writings of leading members of the German Christian Movement, such as Joachim Hossenfelder, Julius Leutheuser, Siegfried Leffler, and the Reich Bishop Ludwig Müller, all written in the early years of Nazi rule. In addition, she provides a thoughtful critique of these views by Professor Paul Althaus of Erlangen, who argued that the conflation of German nationalism, admiration for Hitler, and Christian tradition went far too far by asserting that God’s salvation was being played out in Germany’s history. This, he claimed, was a “bald-faced theological heresy”. But Althaus’ own variant of the “orders of creation” included a positive enthusiasm for National Socialism as a political movement and for an ethno-national Christianity. He utterly rejected any idea that the combination of Nazi politics and the Faith Movement’s version of religion could turn Germany into a world-savior. It is clear that these divisions within the Protestant churches led to Hitler abandoning any hopes he had held that they would combine under his authority. Instead he increasingly supported the anti-clerical and anti-Christian elements in the Nazi leadership, such as Heinrich Himmler, Martin Bormann, Reinhard Heydrich and Joseph Goebbels, who were to institute increasingly severe measures of persecution and repression on the churches. These doomed any chances of the German Christian Movement’s hopes for success. Its leaders made one final bid to win back support in their notable Godesberg Declaration of March 1939, in which they indicated their strong support for the regime’s hostile antisemitic policies and established an Institute for the Study and Eradication of Jewish Influence on German Religious Life. The final document in this collection is by Walter Grundmann, the first academic director of the Institute, whose career continue into the German Democratic Republic, where he served for many years as a pastor, publishing widely-used commentaries on the gospels but also working as an informant for the Stasi. There is little evidence that he changed his view that “the content of Jesus’ preaching shapes and determines his work. In Jesus of Nazareth something utterly un-Jewish appears”. Solberg does not attempt any evaluation of these sources, but her careful and viable translations will be of help to English-speaking students who will now be able to trace the vagaries of this section of German Protestantism during its short but vibrant and mistaken career. It remains to be seen whether the temptations to which these authors gave expression will be repeated in churches elsewhere. She has given us a useful cautionary tale.